The new Canada anti-spam legislation (the “CASL”) regulates how businesses use electronic messages, such as email and voice messages, to contact their clients, prospective clients, and other people they do business with. CASL took effect on July 1, 2014. What does CASL regulate? The goal of CASL is to decrease and eliminate all the unwanted electronic messages we receive. What kind of Messages apply? CASL applies to electronic messages, which have as one of their purposes, the encouragement to participate in a commercial activity. What kinds of Messages are exempt? CASL does not apply to electronic messages sent to someone with whom you have a personal or family relationship (both terms have definitions in CASL). CASL also doesn’t apply when you send an electronic message to someone about the commercial activity they’re involved in, if the message is solely an inquiry or application about that activity. Messages sent by registered charities are exempt if the message’s primary purpose is about raising funds for that charity. What information does CASL require in a Message? CASL requires detailed information to be included in an electronic message, such as the contact particulars of the sender of the electronic message, and requires such information to be presented in particular ways. For example: an email must contain an unsubscribe mechanism clearly and prominently, and the recipient of the email must be able to indicate at no cost that they no longer wish to receive any more emails. How can I establish that a person consents? A person may consent to receiving your message through either implied or express consent. In order to find that such consent has been received, you must satisfy many detailed provisions of CASL. To give you an idea of what CASL is looking for to establish implied consent, the law wants to see that the sender of the electronic message has an existing business relationship or an existing nonbusiness relationship with the recipient (both types of relationships are defined in CASL). For express consent, CASL requires that the person whose consent is sought is notified that they can withdraw their consent at any time. What If I Don’t Comply? CASL is complicated and broad, making it difficult to understand. And it carries a very big stick if you don’t follow it: penalties of up to $1 million for individuals, and $10 million for Businesses! That factor alone should get your attention. If you would like more information about complying with CASL, and how it may affect you, please contact us today. The purchase price and structural aspects of a new home are the natural focus in early discussions between a buyer and the builder’s representative-which eventually lead to signing a purchase agreement. The cost of any new or increase in municipal, provincial or federal government charges levied from the time the purchase agreement was executed to the date of final closing. These charges, which include items such as municipal development charges and park levies, can prove to be quite significant. The likelihood of these adjustments obviously increases, as the length of the time between the time of signing and final closing also increases. Limiting Risk For this reason, with the assistance of a lawyer, a buyer should attempt to find an upper ceiling for adjustments, during the week or so that a buyer is allowed to review the purchase agreement. Most builders, when approached on this matter, will not normally accept any ceiling higher than $2,000 to $3,000, primarily because they’ll be compelled to make up the difference from their profit margin. Taxes Buyers should also be aware that the price in a new home purchase includes an H.S.T. component. The builder commits to the buyer to pay the applicable H.S.T. on behalf of the buyers from the purchase price. However, this commitment is premised on the buyer’s commitment to personally occupy the new dwelling as their primary place of residence, and their assignment of their H.S.T. rebate to the builder. To be clear, this builder commitment does not apply if the buyer is purchasing the dwelling for rental investment. Should the buyers decide at any point prior to the closing, that they wish to now acquire the premises as a rental investment, then they are not entitled to the adjustment made in their favour for the H.S.T. rebate at the time of closing. Consequently, the builder will proceed to add the value of the rebate the buyer is no longer entitled to as an adjustment to the purchase price. As a buyer of a new home, whether it’s a condominium unit or freehold property, the initial foundation for your purchase is having and understanding a well-constructed agreement. Feltmate Delibato Heagle is pleased to announce that Ryan Smith has joined the firm, practicing in our Oakville office. Ryan is a Trademark Agent and corporate/commercial lawyer. He is also a sought-after speaker. Most recently, Ryan has made presentations to the Burlington Chamber of Commerce and the Hamilton Law Association. The law is in constant motion. 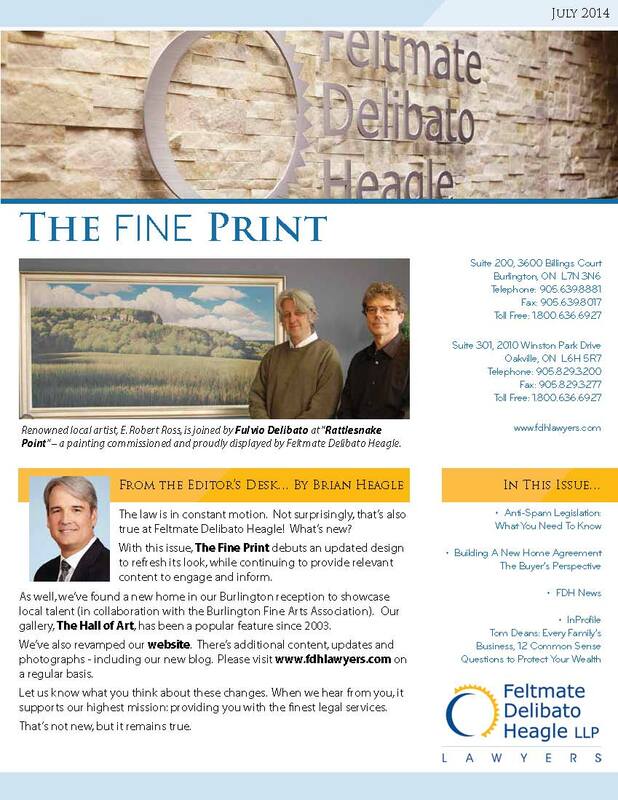 Not surprisingly, that’s also true at Feltmate Delibato Heagle! What’s new? With this issue, The Fine Print debuts an updated design to refresh its look, while continuing to provide relevant content to engage and inform. As well, we’ve found a new home in our Burlington reception to showcase local talent (in collaboration with the Burlington Fine Arts Association). Our gallery, The Hall of Art, has been a popular feature since 2003. We’ve also revamped our website. There’s additional content, updates and photographs - including our new blog. Please visit www.fdhlawyers.com on a regular basis. Let us know what you think about these changes. When we hear from you, it supports our highest mission: providing you with the finest legal services. That’s not new, but it remains true.